Cut zucchini in half. Quarter lengthwise. Remove the seeds with a diagonal cut. Cut again into strips. Mix together flour, baking powder, and salt. Add corn oil and then slowly incorporate mineral water until batter is thick. 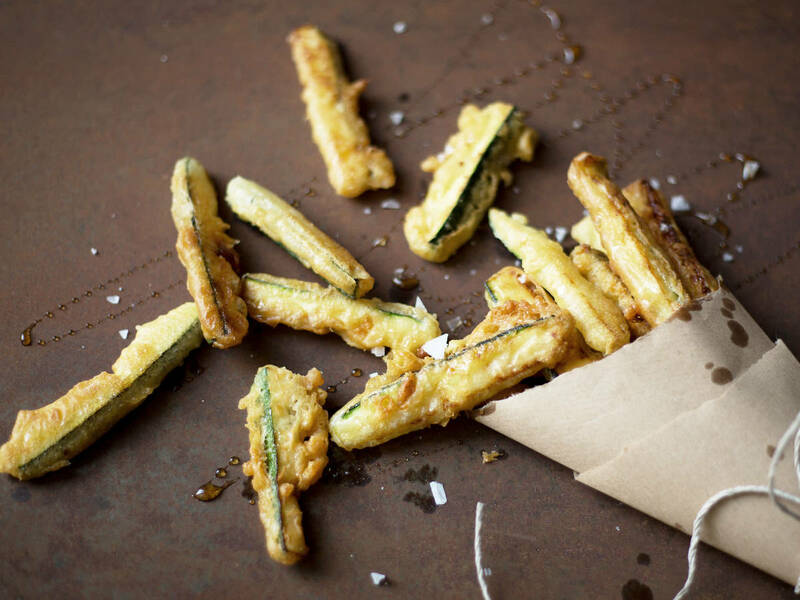 Dredge zucchini sticks in tempura batter until well-coated. In a frying pan, heat up some vegetable oil over medium heat and cook zucchini for approx. 3 – 5 min. until golden brown. Transfer to a plate lined with paper towel and allow to cool for approx. 2 – 3 min. Then, transfer to a serving platter, drizzle with honey, and sprinkle with sea salt .Enjoy right away!